Adderall is a prescription medication that doctors prescribe to patients who suffer from narcolepsy and attentional deficit disorders such as ADD or ADHD. This medication is often abused by college students and others looking to replicate the high achieved by other amphetamines which includes increased energy, improved alertness and attentiveness and reduced appetite. Adderall street names encompass an array of different nicknames which have evolved with the increased use of this prescription drug. Adderall names sometimes depend on the particular pill’s color. According to IPRC, Adderall street names often refer to the appearance of the drug which is generally prescribed in a pill or capsule form. The pills can be black, red or white. Users often crush the pills and snort them or dump the capsules out before eating them to produce a faster response to the drug. 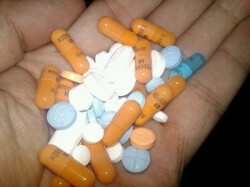 People may also refer to Adderall as “pep pills” because of the increased energy that is felt when the drug is used. “Speed” another common Adderall street name, refers to the increased speed at which a user will talk, walk or act when under the influence of Adderall. Some people who abuse this drug will refer to it as “Dexy” or to the pills as “Dexies” because of the presence of Dextroamphetamine which is in the Adderall. The terms “Beans” and “Bennies” can also be used to openly discuss Adderall to people who use this drug in an abusive way on the streets. “Black Beauties” is the term that is used to talk about the dark pills that are a lower milligram dosage of Adderall. So many different street names are used to discuss amphetamines between people who abuse the drugs in an illicit way. From describing them based on their effects to their appearance, there’s really no limit to the number of street names that user’s will come up with to discuss their drug use without others knowing. Symptoms of Adderall Addiction - An addiction to Adderall will cause increased tolerance, symptoms of withdrawal, and lifestyle changes.